Just as one sun set on our joyriding adventures in Santorini, another one rose to a new day in Athens. Athens, brimming with history as one of the oldest cities in the world, offered a striking contrast to our experience in Santorini. Gone were the whitewashed blue domed buildings and ritzy shops to be replaced with sights of large urban plazas and modern structures. I was surprised to see many buildings covered in graffiti, with half opened businesses and a general abandonment of people in the streets. The country’s debt crisis was clearly evident on every street corner we turned. In an odd way, it reminded me of growing up in Oakland. The present effects of the country’s financial state lay in juxtaposition to vestiges of ancient history. The city center is dense with enough ancient ruins to inspire your inner archaeologist. 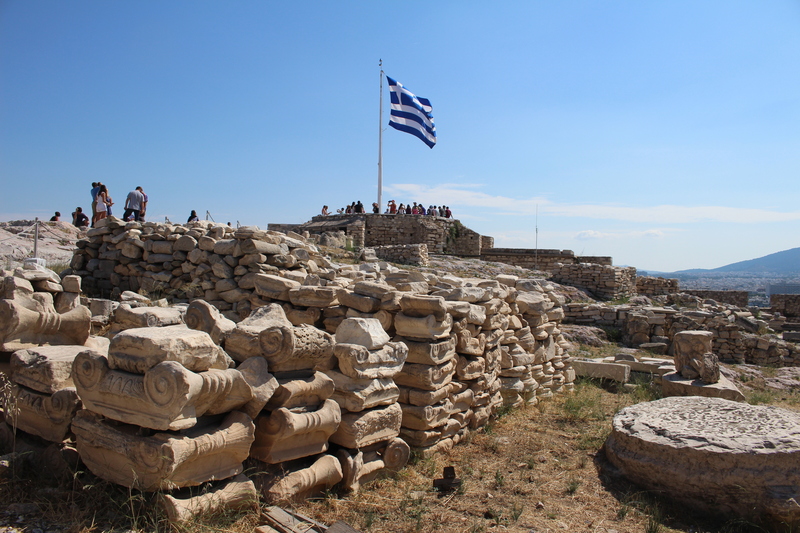 With just one day to see the main highlights of the city, our first stop was of course none other than the Acropolis. Rising above the city, it’s hard to miss this UNESCO World Heritage Site. 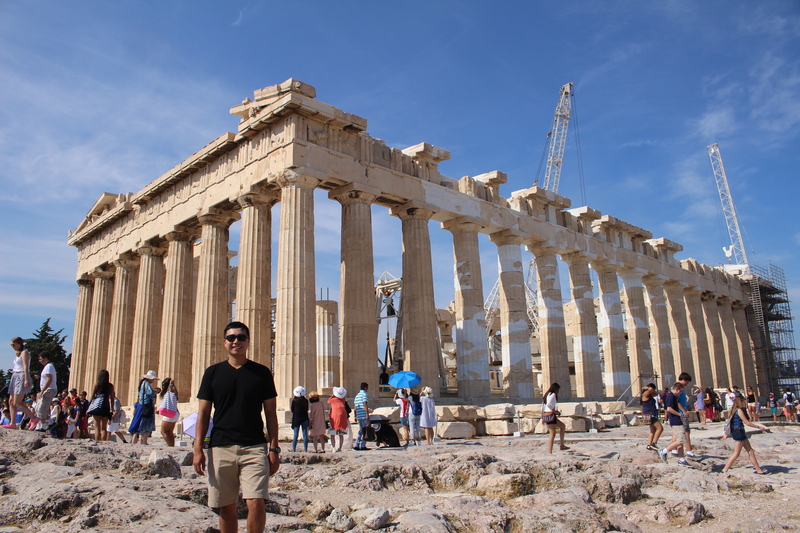 The Acropolis is home to many monuments of significance in Greece’s history and ancient civilization, most notably, the Pantheon. All that is left of the Pantheon is a skeleton of columns with large limestone blocks and other parts of the temple scattered alongside it. There were unsightly construction cranes in the background, but I guess even a team of hardhats can’t rebuild the Pantheon in one day. Despite its age and condition, there was still something marvelous about the colossal marble pillars. It told stories of the ravages of war, the rise and fall of civilization, and the greatness of architectural achievements. As we finished touring the Acropolis, we felt the heat of the asphalt rise up to meet us. It was as if Zeus, the god of the sky (or maybe it was Helios?) was beating down on us to test our will. Would we prevail? 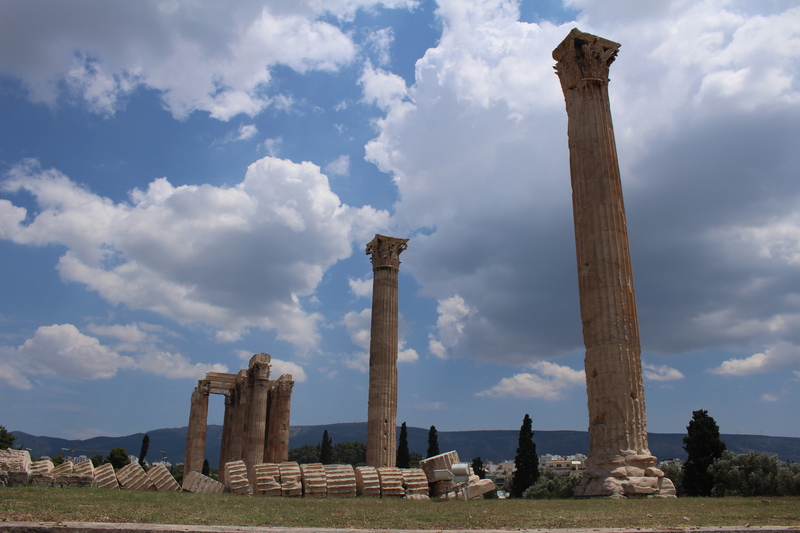 If the Pantheon had nothing but a skeletal framework, then down the hill at the Temple of Zeus was even more desolate. Add a stark contrast of the expansive open space, and the bare bones pillars stood even more lonely and loomed like giant spires as they pierced the blue sky. 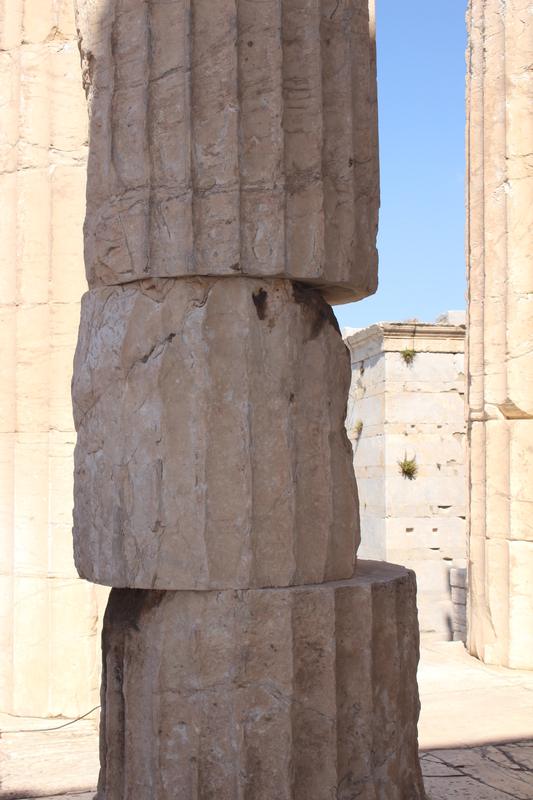 A column lay on its side, a giant struck down, in perfect slices as if they were carrot coins. We both couldn’t even imagine how the temple would’ve looked in its heyday – it must’ve been colossal in order to fill the large field that was now so vacant and bare. And in the heart of it all, was Plaka, the historical neighborhood surrounded by archaeological ruins on all sides, seemingly less scathed by the debt crisis, as it was protected by the tourist bubble. In the labyrinth of narrow streets of shops and restaurants, we stopped for a lunch break with none other than a hot gyro, followed with a cold dessert of Greek soft-serve yogurt. 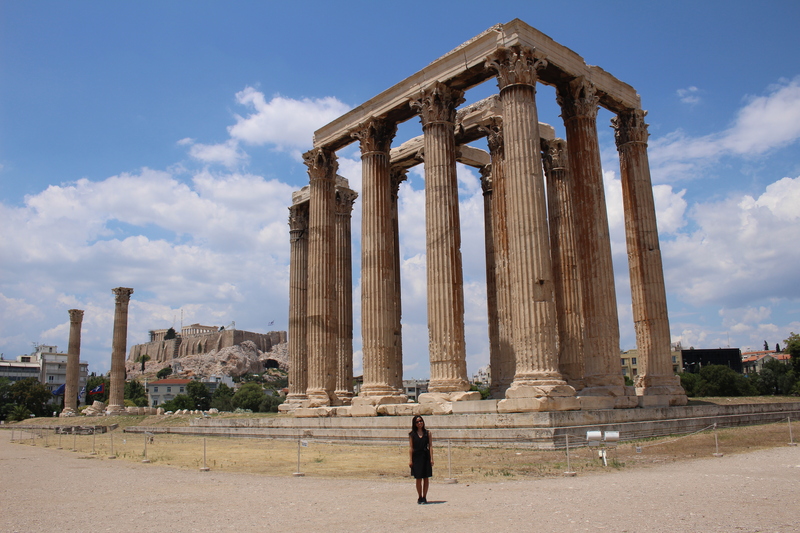 The later afternoon proved to be too hot to visit more ruins, so moving from the history lessons, we sauntered into the shade of modern Athens, down the shopping boulevards and through Syntagma Square. 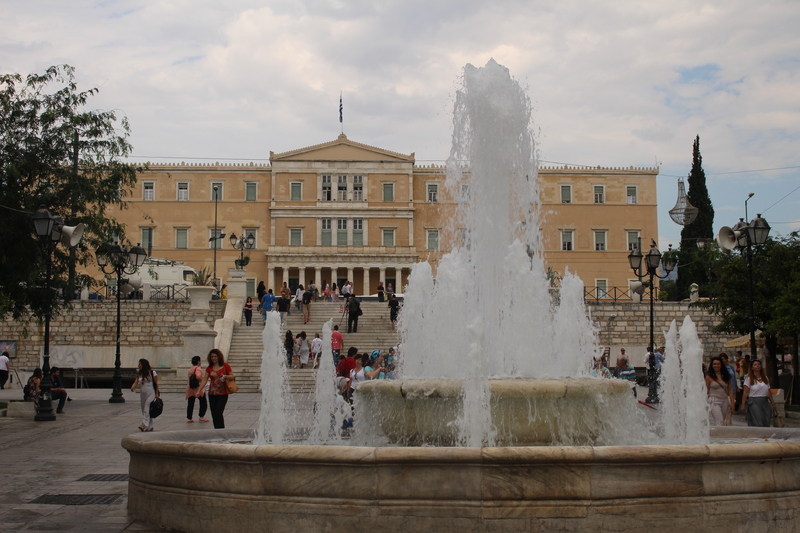 Bordered by the Greek Parliament and other buildings, its location makes it ideal for public gatherings, though there was little activity when we were there. We passed through, snapped a photo, and moved on. After spending all day exploring ancient Athens and contemplating Plato’s philosophies as we walked in his footsteps, we were beat as we headed to the metro. While we quizzically looked at the fare table to figure out how much money to put in, a lady came up to us and told us we didn’t have to pay. Simon and I exchanged confused glances. She mumbled something about the banks being closed. To be sure we weren’t breaking any rules, we watched her and other commuters walk right through the gate without a ticket before we did the same. We supposed that it was a bank holiday or siesta. Little did we know, we’d miss a demonstration the very next evening as citizens rallied together in Syntagma Square upon news of the planned bailout referendum. By then we were already on board a ship departing for Italy, narrowly missing a part of Greece’s modern history.